Much of variable stars research is related to stellar evolution. We have a pretty good handle on how single stars evolve over billions of years. They are born in clouds of dust and gas, contract due to gravity until they reach a critical limit at which nuclear processes begin converting hydrogen to helium and heavier elements. At this point a star is born. The most important factor in the evolutionary track of a star is its initial mass. Giant stars burn up their fuel quickly and die spectacularly. Dwarf stars live for tens of billions of years, miserly using up their fuel while putting out a conservative amount of energy. A majority of stars follow an evolutionary path that eventually causes them to swell to hundreds of times their original radius, throwing off layers of their outer atmosphere via stellar winds and from their losing their gravitational grip on the outer layers of their swollen stellar atmosphere. These stars eventually become planetary nebula with white dwarfs at their centers. These degenerate white dwarf stars are fascinating objects. They do not produce new energy, like stars. They are the remaining ash of the core of evolved stars, slowly cooling through time from their original very high temperatures. They are small and extremely dense, planet sized objects with approximately the mass of our sun squeezed into their small frames. Things get a lot more complicated when two or more stars in orbit around each other are involved. If the stars' orbits are wide enough, each star may be able to follow its normal evolutionary path for billions of years. However, cataclysmic variables are stellar pairs, typically containing a white dwarf and a swollen M dwarf, in orbit around each other so close that the orbital period can be measured in hours. Mass is exchanged from the secondary to the white dwarf via an accretion disk. This interaction has a profound effect on the evolution of the stars involved. Some of these white dwarfs have extremely strong magnetic fields. The accretion process is interrupted in part in intermediate polars, or completely in polars (AM Her stars). No real accretion disk is formed. Instead the mass transferred in polars slams down onto a small area at the magnetic pole of the white dwarf, or goes into strange orbits following the magnetic field lines in an intermediate polar. Fine. We can and do observe all these properties of these binary systems now, along with the outbursts and high and low states of activity CVs are well known for. But, the burning question of the day today was "How do they get this way?" Where do these pairs come from? Are they born as normal stars in unremarkable circumstances that somehow evolve into wild pairs of objects orbiting each other so closely they are exchanging material? How long does this take? How do they lose their orbital energy, and what is that energy converted into? Even more perplexing is, where do the magnetic fields in CVs come from? Above: The common envelope explanation for the evolution of CVs from a pair of main sequence stars, to a pair with a Giant Branch star and main sequence dwarf to eventually becoming a white dwarf and main sequence dwarf pair (CV). The generally accepted explanation is called the Common Envelope evolution scheme. 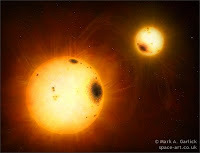 As a pair of stars evolves, changes in the mass of one or both stars affects the orbital characteristics of the pair, and they lose energy and begin to spiral in towards each other. At a critical point in this process one star evolves to the point that it fills its Roche lobe and the pair becomes involved in a cloud of dust and gas shared by both called a 'common envelope'. We believe CVs evolve out of this phase into the semi-detached systems we see as dwarf novae and magnetic CVs. Just how this happens is still not well understood, and how either star acquires a mega-Gauss magnetic field in the process is an even less understood process. The mystery was framed and discussed in a couple very interesting papers given in the afternoon session. James Liebert pointed out the fact that the Sloan Digital Sky Survey has found over 1200 close pairs containing a white dwarf and an M dwarf, precisely the kinds of pairs we believe are the progenitors of CVs, yet none of them have been found to contain a white dwarf with a strong magnetic field. Nearly 25% of CVs are magnetic systems so where do they come from if not these pre-CV pairs? 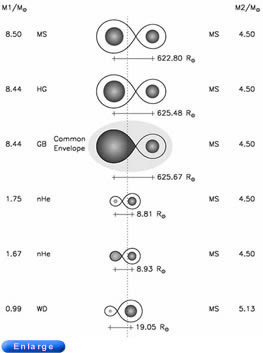 In fact, all highly magnetic white dwarfs appears as either single stars or components of CV binaries. Christopher Tout proposed in the following paper that highly magnetic white dwarfs must be formed as a result of the common envelope phase of binary evolution. 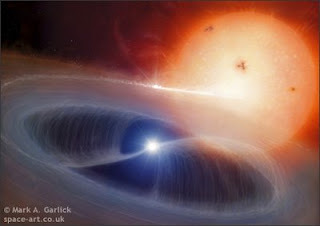 He went further to suggest that the single white dwarfs with the highest magnetic fields are the result of a pair of stars merging into one highly magnetic white dwarf from the common envelope phase. And the magnetic CVs we observe, polars and intermediate polars, are the result of systems that almost merge before eveolving into magnetic CVs. There are also fundamental questions about the evolution of CV pairs. Do these stars continue to spiral in towards each other, reaching shorter and shorter periods? How does accretion and mass loss affect this evolution? How do we explain the well known 'period gap' where there are almost no actively accreting systems with orbital periods between 2 and 3 hours? A graphical demonstration of the period gap. The vertical axis is the number of known CVs. The horizontal axis is the period in hours (top) or fractions of a day (bottom). What is so special about this orbital period? What shuts off the accretion process at 3 hours yet lets it re-engage at less than 2 hours. What is the actual period minimum for CVs? Is it 65 minutes, as theory predicts, or is 80 minutes, as observations seem to imply? There are lots of questions. I hope to get at least some of the answers this week. Stay tuned, and we'll find out together.